The first recorded history of the Mount Laurel Police Department occurred in 1938. This was sixty-six years after the incorporation of Mount Laurel Township. However, this force was only in existence for seven months. An old, anonymously written news article sheds light on this early brief history. January 1st, William T. Nardin was elected to the Township Committee. Upon his urging, the Committee created the police force and named Nardin the first Director of Public Safety. At that time, a budget of $1000 was established for three “special” officers, one of which was always on call. Two more officers were added to the Department. All officers hired were sent to Woodbury for a 16-week training period trained by the New Jersey State Police. The men were sworn in on June 1st, after the training period was completed. In addition to being expected to risk life and limb, the officers had to buy their own uniforms, operate their own cars, buy their own gasoline and oil and make their own repairs. For their service, they were promised $100 to split among themselves at the end of the year. After seven months of service, the Township Committee voted to eliminate the police force by a vote of 2 to 1. William Nardin was the lone supporter of the Department. Full-time Police Force reactivated by Township Resolution. 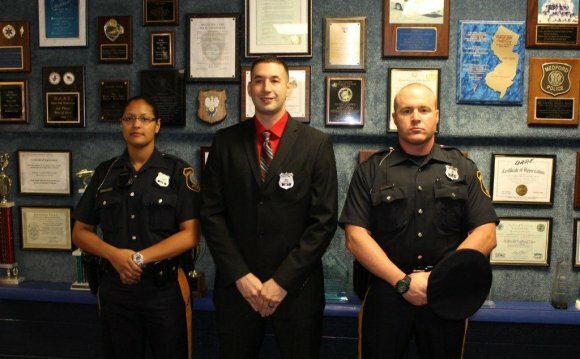 The police department was reorganized and Constable Tony Panarello was named as Chief of Police. Police headquarters was located at the residence of Chief Panarello on Church Road in the Fellowship section of the Township. The first police cars were two new 1956 Chevrolets. The police station was later moved to Old Farmers Hall located at Moorestown Mount Laurel and Hainesport Mount Laurel Roads. It consisted of a small corner office on the bottom floor of the building. The 2nd floor of the building was a meeting room where town business and municipal court sessions were held. Throughout the 1950’s, the community remained a quiet rural and residential area consisting mostly of farms with horses, cattle and crops. The calls for service mostly involved traffic accidents, disorderly person calls, domestic disputes, calls for loose horses and cows on the roadway. The phone was controlled by a toggle switch located at the Farmers Hall that switched calls to the Moorestown Police Department while the station was unmanned. Calls for police service were dispatched through Moorestown Police dispatcher. The dispatcher would log incident cards for Mount Laurel Police Department calls for service. The duties of the officers expanded to include crime prevention and public relations details such as lecturing in the schools and performing bank escorts for merchants.